Despite advances in technology, the fledgling music industry had a problem: it could not mass-produce records. For a brief period, every recording committed to wax was unique, forcing labels to find creative ways of meeting demand. Recording on a phonograph, 1905. With the launch of Thomas A. Edison’s Perfected Phonograph in 1888, recording technologies entered the lives of a significant part of the world’s population. Whereas Edison’s original 1877 phonograph was saluted as a scientific milestone, commercially it had remained little more than a promising business idea. The Perfected model, louder than its predecessor and recording on to wax cylinders instead of the original tinfoil, soon appeared in social clubs, inns, hotels, funfairs, theatres and other public spaces throughout the 1890s. Perfected models were sometimes paraded around by exhibitors, who bought it or leased it from Edison. They were also put on permanent display and patrons could operate them via a coin-slot mechanism. Better quality models were released from the mid-1890s onwards suitable not just for public exhibition, but also for domestic entertainment. 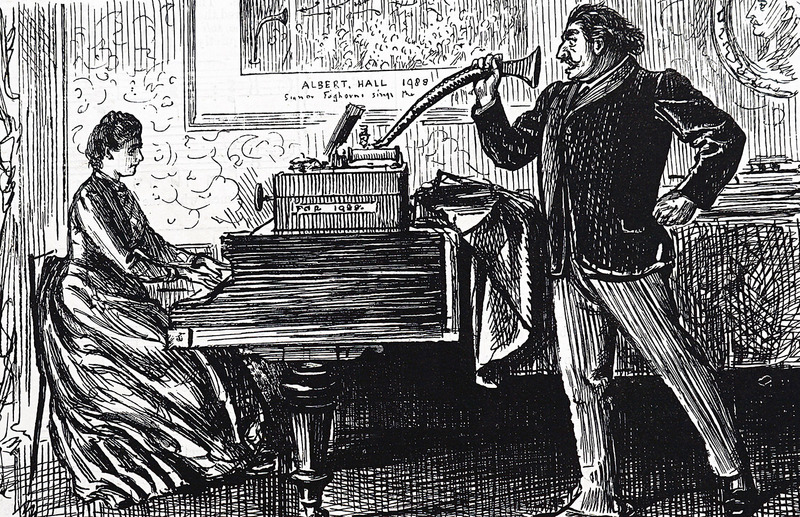 Many in the middle and upper classes rushed to acquire their own talking machine, as well as a set of wax cylinders containing their favourite music or spoken word pieces. The process of making records was long and laborious. Each record sold was an ‘original’, that is to say, the artiste had to use his efforts over and over again so that if a hundred records of a particular selection were ordered that selection would have to be played a hundred and even more times. It is difficult to envisage a world in which every recording was practically unique: popular recordings are defined by their reproducibility. The music industry gives out prominent awards to records based on the number of copies sold. Reproducibility also inspired some of the earlier critiques of the recording industry by prominent left-wing thinkers such as Walter Benjamin and Theodor W. Adorno, concerned with the industrialisation of an increasingly uniform cultural landscape as it moved into the mid-20th century. This would have been impossible in the early days of the recording industry. After the development of the Perfected Phonograph, producing a reliable method for duplicating recordings on an industrial scale never ceased to be a concern for Edison, his competitors and small business and entrepreneurs scattered across the world, who had started selling talking machines and recordings. 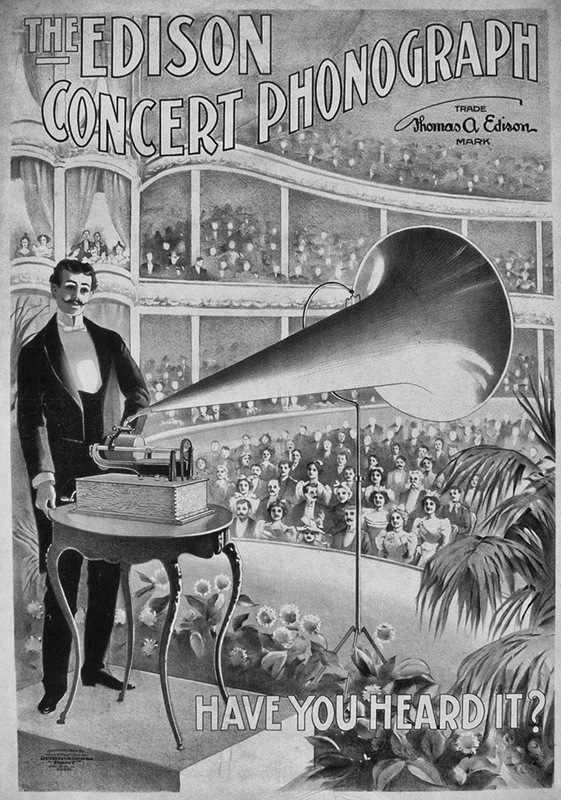 The phonograph’s main competitor, the gramophone – which recorded on discs and not wax cylinders – was redesigned in 1896 by Eldridge R. Johnson. His improvements included the possibility of producing multiple plates from a single master. 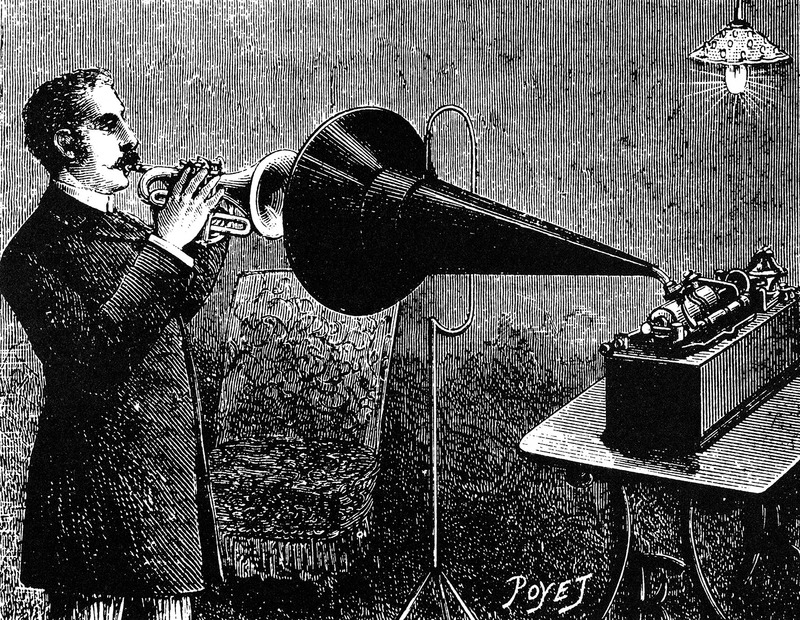 Nevertheless, poor quality of reproduction and the phonograph’s prestige meant that it would still take five years for the gramophone to start threatening its competitor’s monopoly. Before this happened, patents for wax cylinder duplicating machines or improved wax formulas which allegedly made duplication easier were filed all over the world, with varying levels of success. Small recording labels soon discovered ingenious solutions to the problem of reproduction which did not involve a mechanical process. For example, a singer or instrumental musician would sometimes be required to perform in front of not one but multiple phonographs, each of them fitted with its own cylinder. These would then be sold as copies of the same recording. Some in the industry saw this practice as detrimental to recording quality: due to the device’s high sensitivity, obtaining the best results required the musicians to stand in a carefully chosen place. Using multiple phonographs placed at different angles meant that the quality could not be consistent across recordings. For other companies, the secret to achieving duplication involved what we might regard as abusive working practices. We know, for example, of a flamenco singer by the name of Antonio Pozo, ‘El mochuelo’, who, despite not being particularly known for his stage performances, achieved remarkable success in Madrid around 1900 recording for the various gabinetes fonográficos (recording studios) active in the city at the time, which sold phonographs imported from the US and France, as well as employing local artists to produce and sell their own recordings. One of the gabinetes, Viuda de Aramburu, offered Pozo an exclusive contract, probably the first exclusive recording contract to be issued in Spain and one of the first anywhere. Pozo accepted, but on the evening before his agreement with Viuda de Aramburu was due to start, he was summoned by the owner of a rival gabinete, José Navarro Ladrón de Guevara, who had Pozo record multiple copies of his greatest hits without interruption from seven in the evening to seven the next morning. Cartoon by George du Maurier, Punch 1888. Some companies and entrepreneurs chose to make a virtue of the technological limitations of wax cylinders, and their advertisements and catalogues emphasised that each of their customers would be acquiring a hand-crafted, unique piece. Another gabinete owner from early 20th-century Madrid, Álvaro Ureña – a former soldier who left the army to experiment with electricity and then with recording technologies – sent a letter to several local newspapers in February 1900 criticising his competitors who produced multiple copies of the same cylinder by having singers perform in front of more than one device. He argued that this was contrary to the spirit of the nascent art of phonography and claimed that he had never duplicated – and would never dream of duplicating – one of his cylinders, as he regarded himself as an artisan as well as an industrialist. Even though other entrepreneurs were not as extreme as Ureña in their adherence to artisan principles, certain particularities of recordings which survived the wax cylinder era by a few years suggest that many were rather attached to the idea of recording as a craft, distinct from the industrial processes that were dominating most areas of economic activities. Until the 1910s, each commercial recording would typically contain a spoken announcement at the beginning, giving details about the title of the piece, the names of the musicians involved and the company they were recording for. Companies regarded this announcement as the distinctive trademark protecting them from counterfeits. Other companies sold recordings hand-signed by musicians. Milan-based label Fonotipia, which specialised in opera, was still doing this in the late 1900s as a legacy from the wax cylinder era. Technological limitations also had an impact on the type of material that was recorded and that has been preserved. When the phonograph was first presented in 1877, Edison envisaged that it would be mostly in demand in business contexts as a dictation and communication machine. But many around the world, speculating on the potential uses of the newly invented machine, hypothesised that it would make the voices of the best international singers and entertainers accessible to everyone. A similar argument was made about speeches by well-known politicians and proficient speakers. As more phonographs were sold through the 1890s, the demand for recordings increased, but, without a reliable duplication process, it soon became clear that such a demand could not be met exclusively by well-known, celebrity singers. Moreover, celebrity singers were not necessarily interested in recording: some were concerned about the technological capabilities of early models to accurately reproduce their voices and recordings also offered little financial incentive to performers who were otherwise very much in demand on stages all over the world. 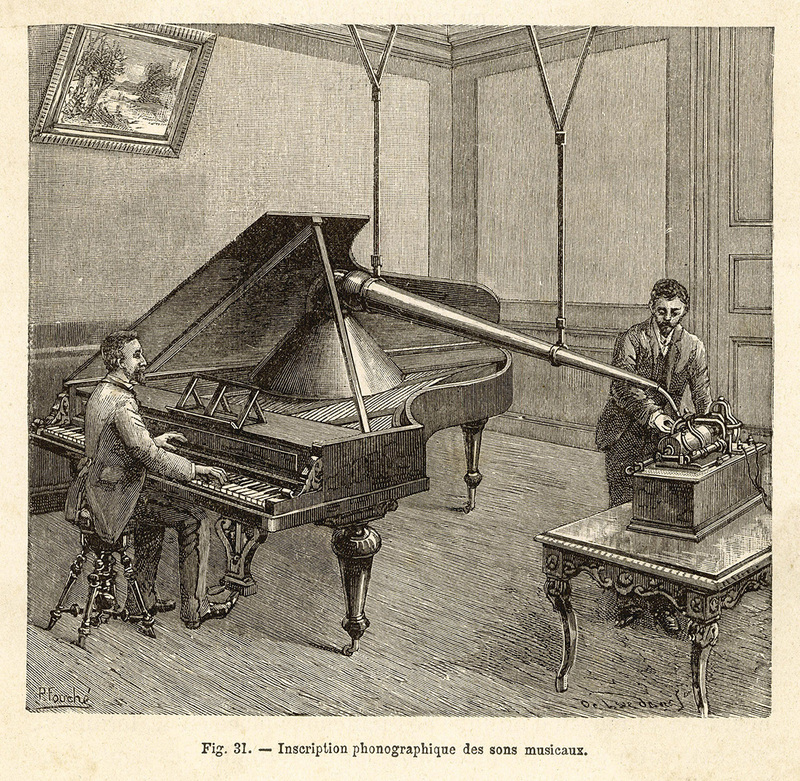 Recording a man playing the piano using the improved phonograph, 1891. It was different, however, for working singers who did not have an international reputation and who welcomed the extra money that recording sessions brought – during the summer months, for example, when they were not employed at a theatre between seasons. The catalogues of Spanish gabinetes include a few celebrity singers, such as operatic soprano Josefina Huguet, zarzuela (a traditional form of musical comedy) soprano Leocadia Alba and operatic baritone Ramón Blanchart. But the lion’s share of their catalogues was made up of a variety of lesser-known performers with varying levels of success. Some of them are known to have had solid, if not stellar, careers in modest theatres and touring the provinces. Others, however, are more difficult to track down beyond a few mentions in the press, suggesting that their careers might have been short-lived or that they specialised in secondary roles. Of others, such as soprano Elena Nieves, there is no evidence that they had any sort of stage experience. Their names (and sometimes voices) are known to us only through the recordings they made. We might regret that we lost the chance to hear the voices of some legendary performers because they died or retired before commercial recording technologies became sufficiently viable for them to consider walking into a studio. One example is tenor Julián (or Giuliano) Gayarre, who died in 1890: although there is speculation over whether he left recordings of his voice, there is no firm evidence that he did. But, on the other hand, the relative variety we have of lesser-known working singers reveals how people experienced live music. This is particularly true of popular genres which attracted large audiences, such as zarzuela in Spain, music hall in Britain, opera in Italy and cabaret in France. These recordings offer us a realistic, nuanced snapshot of the sort of singing regular audiences would be hearing, barring the occasional and certainly exceptional (in many respects) encounter with a celebrity singer. Listening to such recordings is an illuminating experience, both from a historical and an artistic point of view. In opera we find voice types singing repertoire that we would not expect today – for example, both lighter and heavier varieties of soprano recorded Mimí’s arias from Puccini’s La Bohème. In these early recordings, we are faced with singers whose voices and musical abilities might not be remarkable by themselves – and the deteriorating quality of the recording support does not tend to do them any favours. Regardless, we can often sense that behind the recording there is not so much a singer as a singer-actor, with superb diction and a considered, intelligent understanding of the text they were conveying to audiences who would be utterly familiar with the conventions of the genre. If we listen carefully, we might start to suspect that contemporaries would not have bought these recordings primarily for their musical quality. 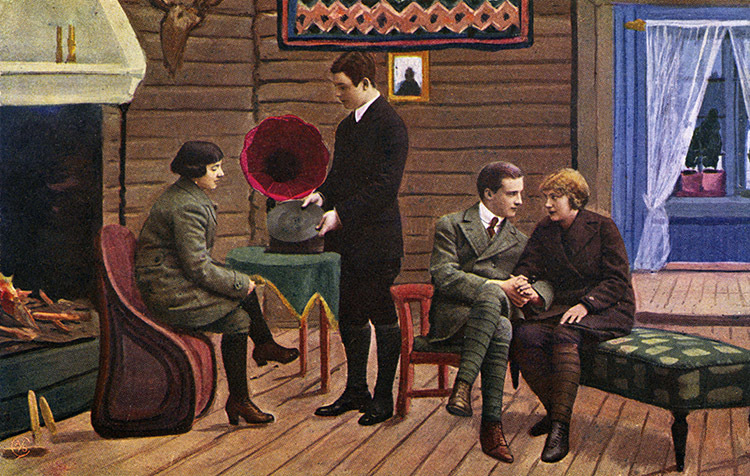 It is likely that they would have seen and heard the performer in question on stage, and so the wax cylinder would function as a memento – an auditory postcard, so to speak – to remind listeners of the whole theatre-going experience, where a less-than-optimal voice would be more than made up by a talent with words, outstanding stage presence or superb acting abilities. Gold-moulded wax cylinders, launched by Edison in 1902, enabled a more reliable duplication process than had been achieved by the various duplicating machines. Despite this, the phonograph would soon lose out to the gramophone, whose discs could easily be multiplied. A new era had begun, and the recording industry never looked back: surviving unique wax cylinders from those years remind us, though, that many facets of recordings that we see as the norm were not so from the beginning, but were rather the product of complex technological, cultural and artistic shifts involving entrepreneurs, musicians and listeners from all over the world. Eva Moreda Rodríguez is Lecturer in Music at the University of Glasgow and the author of Music and Exile in Francoist Spain (Ashgate, 2015) and Music Criticism and Music Critics in Early Francoist Spain (Oxford University Press, 2016).